Yesterday I turned 26. I don’t feel all that old all the time, but it kind of comes in spurts. Like when I chaperoned a lock in for middle and high schoolers at my church and the DJ played Blackstreet’s “No Diggity” and NONE OF THEM HAD EVER HEARD OF IT. Except of course, Baby Einstein, but Rach and I have made sure she’s cultured in the music and trends of the early to mid-1990s. That’s an older sister job. But still, how could these youth not know the song that, had I made a soundtrack representing my middle-school life, would be as high up on the mix tape as track 3 or 4? THE HUMANITY. What was I saying? Oh. I had a birthday. After 21 though, no age is really much different from the one before it, at least it doesn’t seem like it – ask me again when I’m 30 though..whoa. But I don’t really have anything to complain about as far as 25 goes. For me, 25 was a pretty good year. Went on some awesome trips, moved into a new apartment, bought a new car and made some pretty big changes that have continued to work out well. 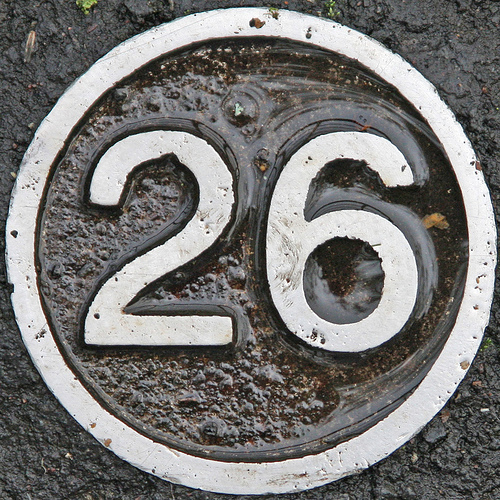 I’m assuming, hopefully, that 26 will be just as awesome, if not better. It sure started great. Even though it was on a Monday – instead of Thunder or Easter like it has been in the past – it was a decent Monday. Started my day at Starbucks and got flowers at work, which was nice. Then, I went to lunch with my editor and throughout the day got lots of Facebook love (my friends are great). Dinner was PF Chang’s and then we did cake – cheesecake in my case, I don’t like regular cake at all – and opened presents. I already knew what I was getting for the most part, my family is going to see Wicked in May and since I didn’t/don’t really need anything else at the moment, I asked my parents to just go ahead and buy my ticket for me. So, I’ve asked that they sing “Happy Birthday” to me again while we are in our seats waiting for the show to start. No one will look at us like we’re crazy, right? Also, I got some gift cards, and let me tell you, that is one of the best presents ever. I’ll be spending some time at Half Price Books, Target, Barnes and Noble, McAlister’s and on Amazon.com in the next few weeks thanks to my awesome family and roommate. We capped off the night at my parents’ house talking about our fears. I won’t name names, but someone feels like she’s suffocating if her ears are covered. Someone else is just as afraid of whales as sharks because you could just be swimming along and all of the sudden you see a giant whale mouth underneath you. Also, sharks can get to lakes. And boats, bears and tight spaces are no fun at all. Did I mention my family watches “I Shouldn’t Be Alive” a lot here lately? Thanks for all the birthday wishes, friends! !